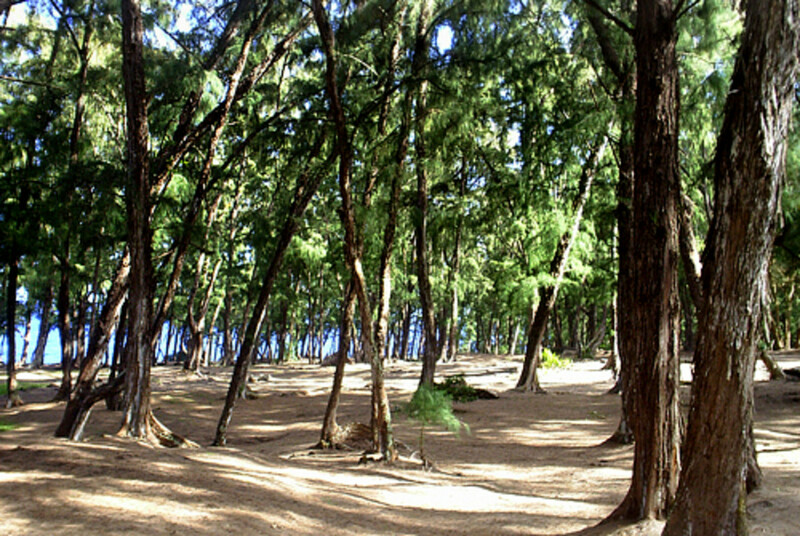 MacKenzie State Park is located in Opihikao on the scenic Red Road that follows the rugged Puna coastline. This remote and beautiful 13-acre park is named after Albert J. MacKenzie, a dedicated forest ranger on the Big Island, who died in 1938. A forest of tall ironwood trees (many of them planted by MacKenzie himself) surrounds the park, and their fallen needles blanket the ground like a thick spongy carpet. The park offers breathtaking views of the ocean front, with rock cliffs on the blue Pacific. Decades ago, lava from Kilauea volcano had flowed in underground channels (lava tubes) through the park and drained into the ocean. Today, a large lava tube cave can be seen near the park’s picnic pavilion, as well as numerous sea caves (lava tube openings) along the cliff’s edge. Take in a round of disc golf with friends. Nap. 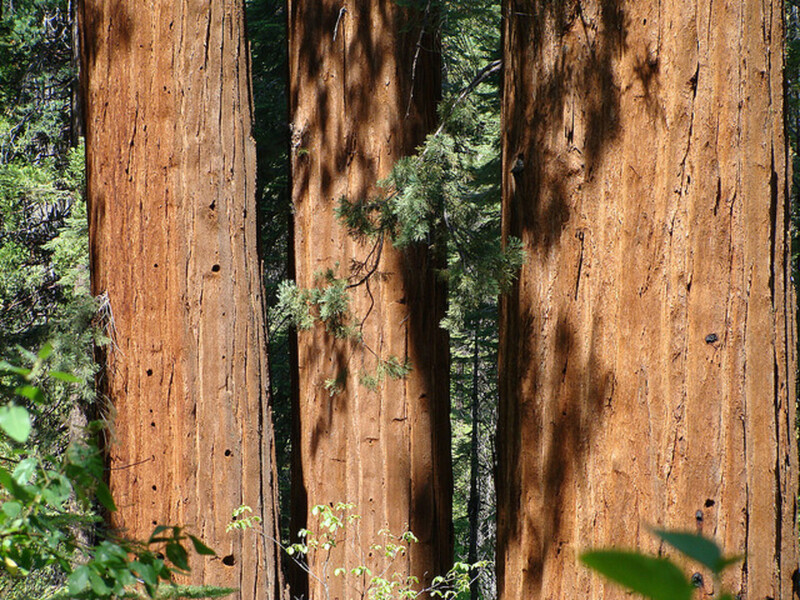 There is plenty of shade and the soft, cushiony ironwood needle-covered ground is just begging you to lay on it! Overnight camping is also allowed, but you must obtain a permit from the Hawaii State Park Division. Fish. Local fishermen also come to the park at night to fish along the low rocky shores. MacKenzie State Park was built by prison convicts in the late 1850s. This was during the height of the sugar plantation era in Hawaii and the convicts — mostly plantation laborers who committed crimes — were shipped over from Honolulu’s prison camps. 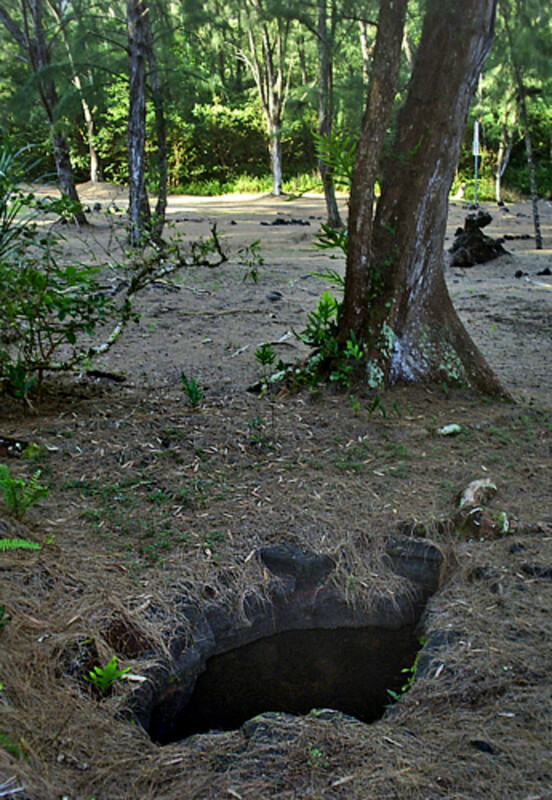 Working under the unforgiving conditions of an isolated area, the convicts cleared the thick rainforest and removed large lava rocks to level the park’s ground. Many of them succumbed to the hot humid climate, did not have any sanitary water to drink, and suffered from an outbreak of diseases. There are no records of where their bodies are buried, but presumably it's somewhere in the park. To this day, local residents believe the souls of the dead convicts are still wandering the park. Park visitors have occasionally reported seeing ghostly apparitions of emaciated and unshaven men carrying pick axes and hand tools at sunset time. Those who camp overnight have also reported seeing in a far off distance what looks like a large campfire with sounds of people cooking and talking. However, when they attempted to go toward the campfire, it seemed to shrink farther and farther away and then it would suddenly disappear altogether! In daylight, no evidence of any campfire or large camping group can be found. King’s Highway is an old coastal rock trail built by King Kamehameha the Great who ruled the Hawaiian islands from 1795 to 1819. 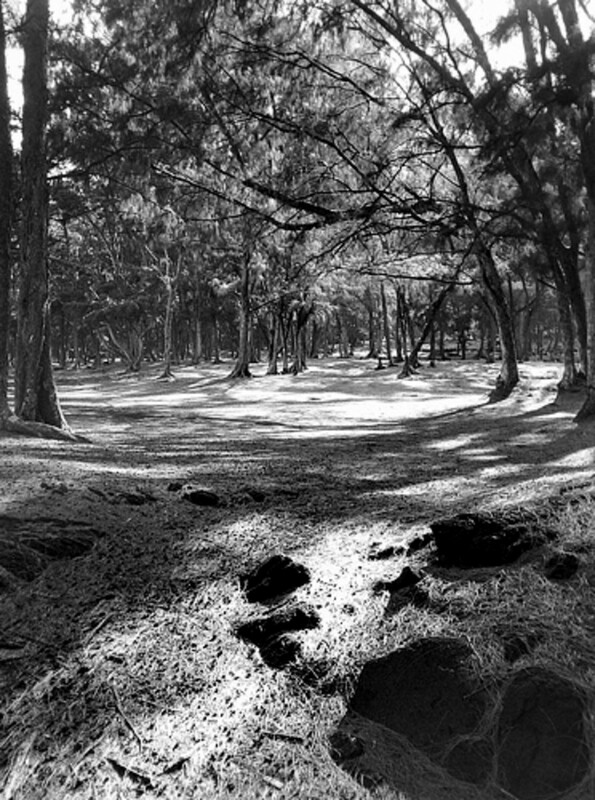 This trail circled the entire Big Island and, for many decades, served as a major travelling route for native Hawaiians to go from one end of the island to the other. A restored section of this historic trail passes through MacKenzie State Park. 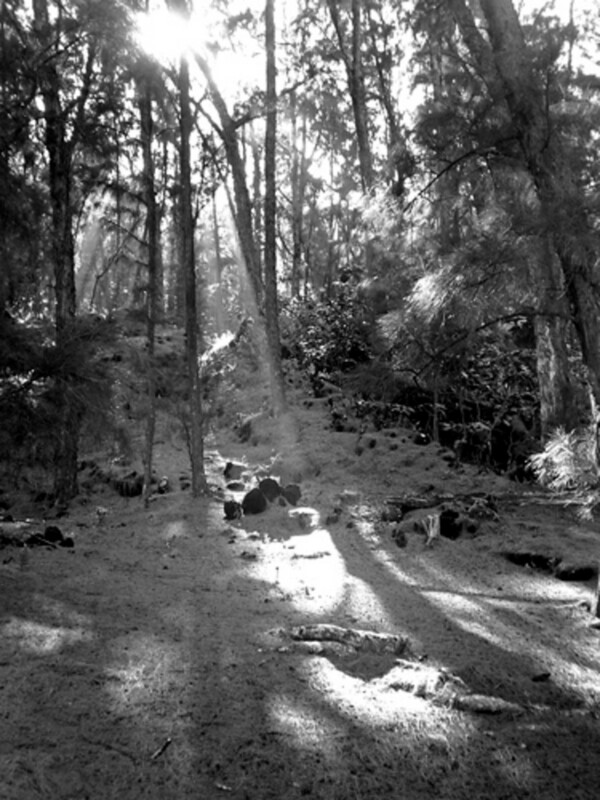 Local legends say that the ghosts of ancient Hawaiian warriors, called the ‘night marchers,’ are still using this trail. Over the years, people have witnessed eerie sights like a procession of disembodied flickering torches or heard haunting sounds of drumming, chanting and battle cries. These occurrences often happen during a windy rainstorm or on calm moonlit nights. 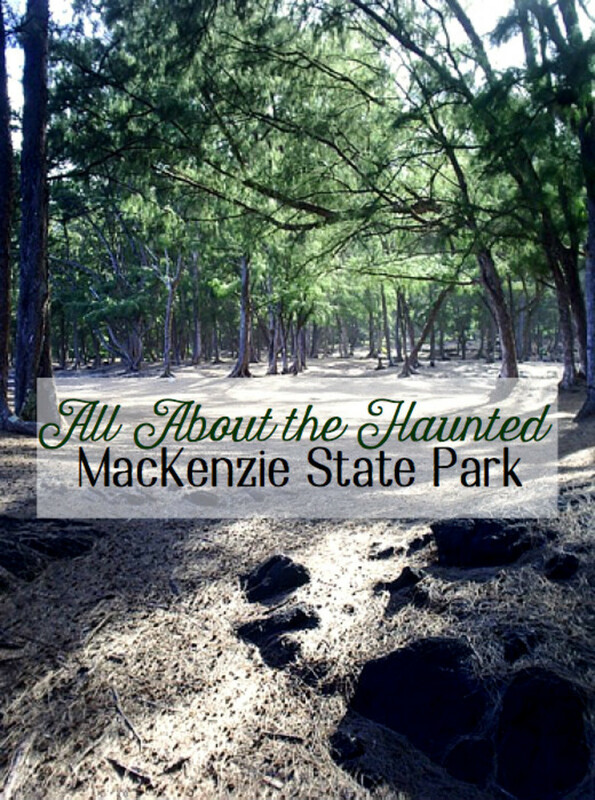 Many local residents refuse to venture into MacKenzie State Park after sunset or on full moon nights for fear of an unwanted encounter with these fierce ancient spirits. In 1980, a young couple was camping in the park when they were attacked and severely beaten outside their tent during the night. Their bodies were found by other campers the next morning — the man was dead and the woman was barely alive. No arrest was ever made, and the crime remains a mystery to this day. In 1993, a 16-year-old girl was kidnapped and raped by three men. 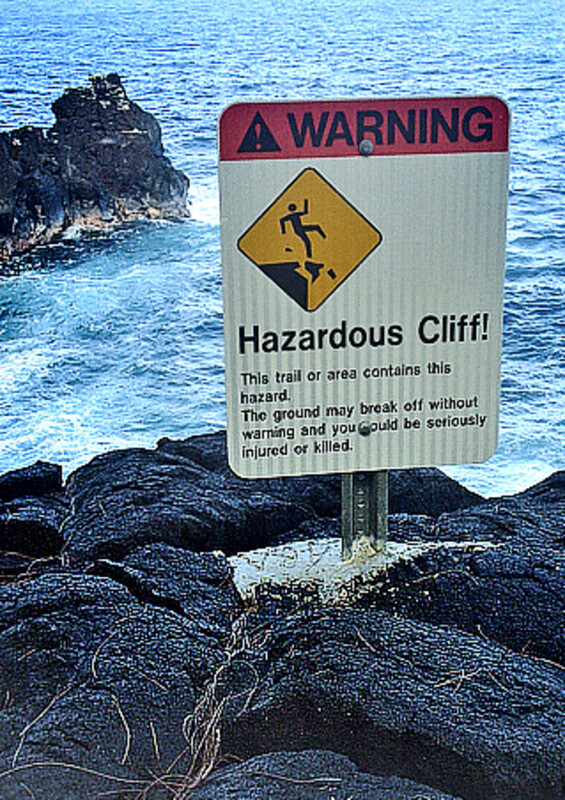 After beating the victim unconscious, the three men disposed of her body over the cliff in the park. The men were arrested and, according to their confession, the victim was still alive when they threw her into the ocean. Her body was never found. Most recently, in 2008, while filming the movie “The Tempest” (by Miramax, with Helen Miren and Djimon Hounsou) on location at the park, the film’s cast and crew discovered the bullet-riddled body of a well-known local surfer at the bottom of the sea cliff. There are also many reports of drowning accidents at the park. Most victims were unprepared fishermen swept away by big waves and strong currents. 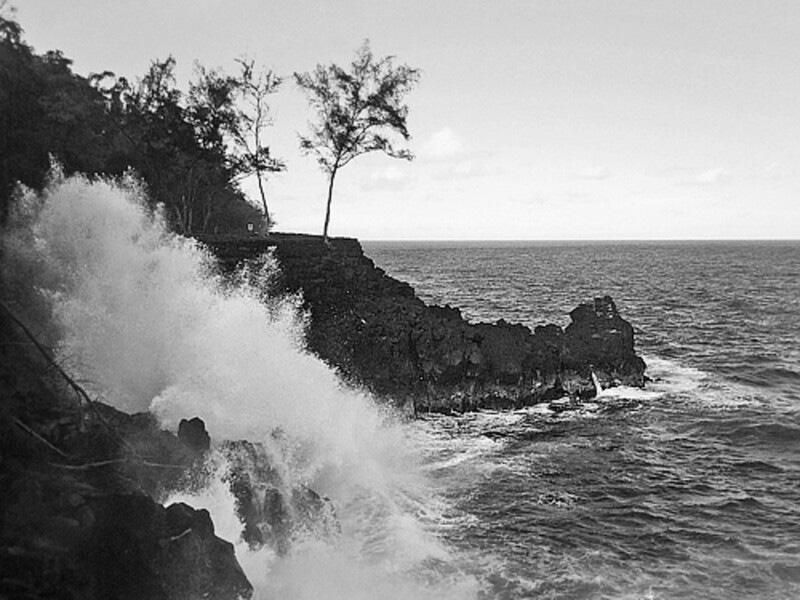 During high surf periods, the crashing waves can rise to 30-40 feet high above the cliff, washing everything (including large chunks of rock and even a few ironwood trees!) into the ocean. The bodies of drowned victims are rarely recovered in these treacherous waters. For years, local residents have reported seeing ghosts or experienced strange unearthly phenomena at MacKenzie State Park. Some of these occurrences have happened in broad daylight. For example, there have been stories of folks who have hiked on the trail along the park’s cliff who reportedly heard footsteps following them. Then, when they turned around to look, there was no one. 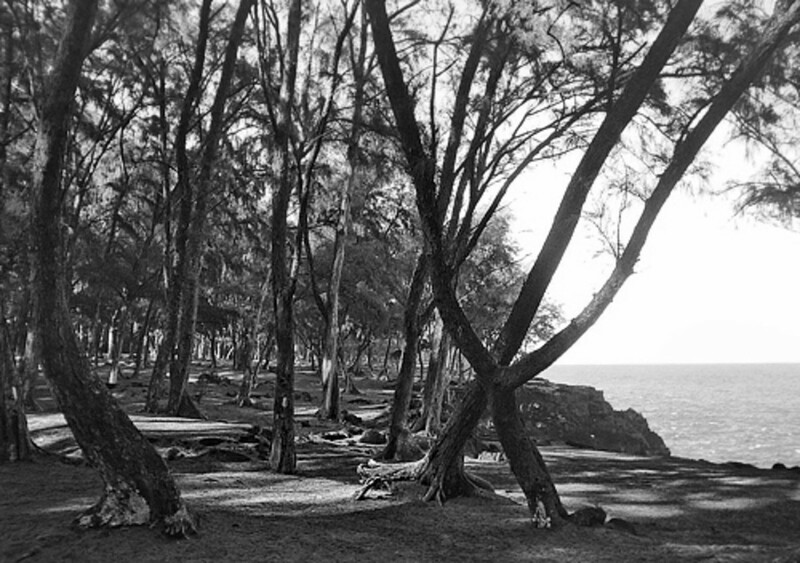 Native Hawaiians have long believed the park to be a spiritual place — a shadowy territory that belongs to the lost and restless ‘uhane (human souls). The eerily quiet ironwood forest always seems to possess some kind of unsettling energy or supernatural feeling to it. 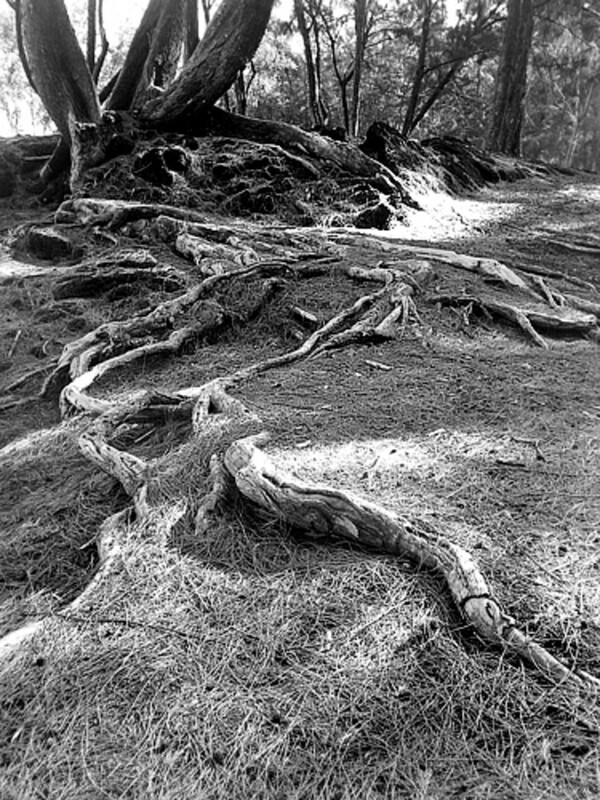 Many of the ironwood trees in the park are very old, and their exposed roots spread out over the ground like snakes or gnarly fingers! One local resident recalled that as she was taking a walk in the park one afternoon, she saw someone ahead of her on the trail. Whoever that was then turned around, gave her a wave, and then vaporized into an ironwood tree right in front of her eyes! People who take their dogs to the park have noticed that the dogs will sometimes appear and act nervously for no apparent reason. Or, they've barked hysterically up a tree at what appears to be nothing. 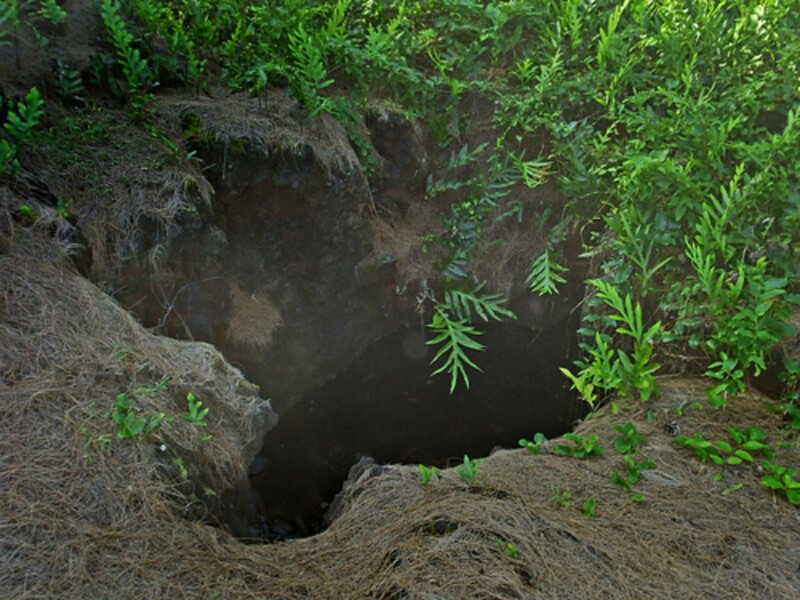 There are also reports of cries and whispers heard inside the many gaping holes in the ground (collapsed lava tubes) seen around the park. 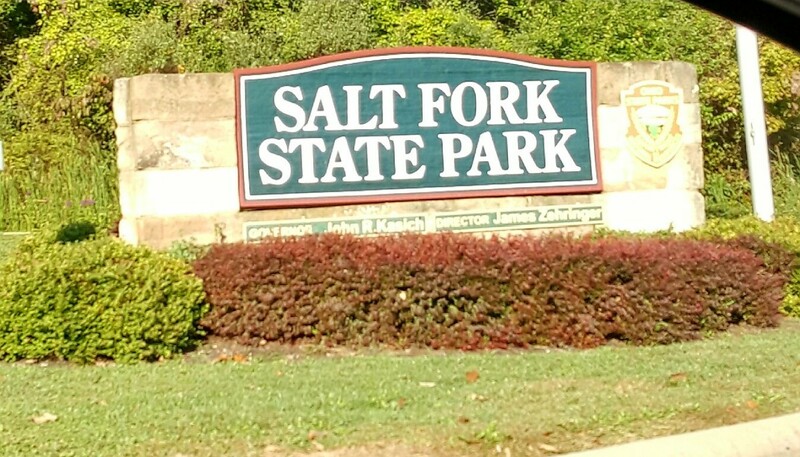 Visitors who camp at the park for the first time — those completely unaware of the park’s reputation — usually have the creepiest stories to tell. Some have heard voices and footsteps around their tents all night with no apparent people in sight when this was further investigated. Others have claimed they were abruptly awakened in the middle of the night by bloodcurdling screams outside in the dark. A few have experienced frightening paranormal encounters, like being choked while sleeping by a presence inside their tent. Or, sleeping bags suddenly being unzipped and pulled away by invisible forces. There have also been reports of tents being shook up violently and repeatedly throughout the night without any explanation. People who take pictures at the park are sometimes baffled at mysterious objects appearing out of nowhere in some of the shots. Local fishermen who fish in the park at night have witnessed mysterious iridescent fireballs that bounce and roll along the surf, and then disappear into the sea caves at the bottom of the cliffs. Overnight campers have also reported seeing similar flickering green fires dancing around the park. Some thought they were fireflies. But alas, this insect does not actually exist in tropical Hawaii! From Pahoa village, head east on Hwy 132 (Kapoho Road). Keep going straight as the road turns into Pahoa Pohoiki Road. Follow this narrow scenic road for about 5 miles and you will come to a stop sign. At the stop sign, turn right onto Hwy 137 (Kapoho Kalapana Road, also known as the Red Road). Drive for another two miles or so, until you see the MacKenzie Park sign and park entrance on the left side of the road. MacKenzie State Park is open year round with no entrance fee. There are picnic areas and bathroom facilities available. Overnight camping is allowed with a permit - but do so at your own risk. Stay back from the unstable cliff’s edge. You can even feel the ground shake from the pounding waves! Keep a good, respectful distance from the memorial shrines you may see along the cliff’s edge. There could be a cross or a plaque, often surrounded with flower leis and personal memorabilia placed there by the deceased’s family and friends. This is an isolated area, with no cell phone service and limited police coverage. So, use your common sense and be safe while enjoying this amazingly beautiful park. 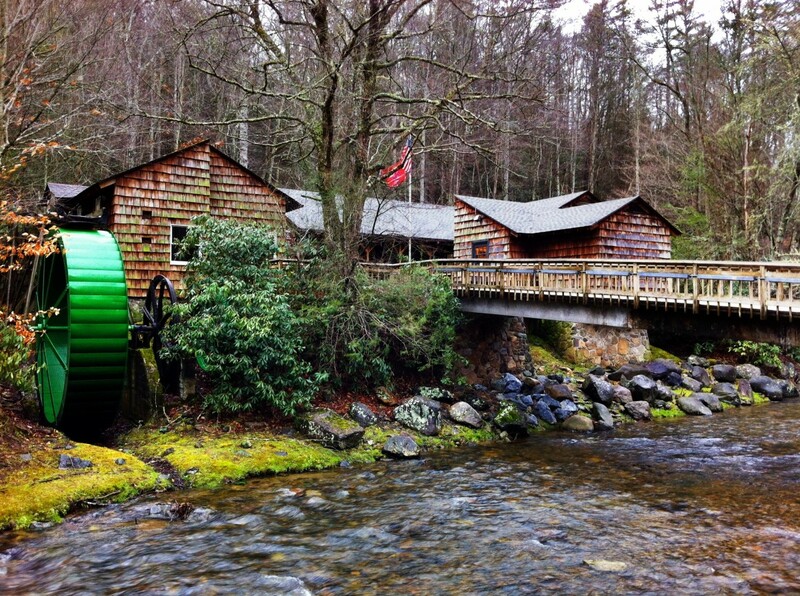 Have You Been to MacKenzie State Park? Yes I have, and it's definitely haunted! Yes I have, and I don't think it's haunted. When you visit MacKenzie State Park, whether you want to believe or not, you may be walking among the living and the dead. Please have respect for the unknown realm. Thank you for visiting, and I hope you enjoyed this article! If you've been to the park, please share your experiences with us below. 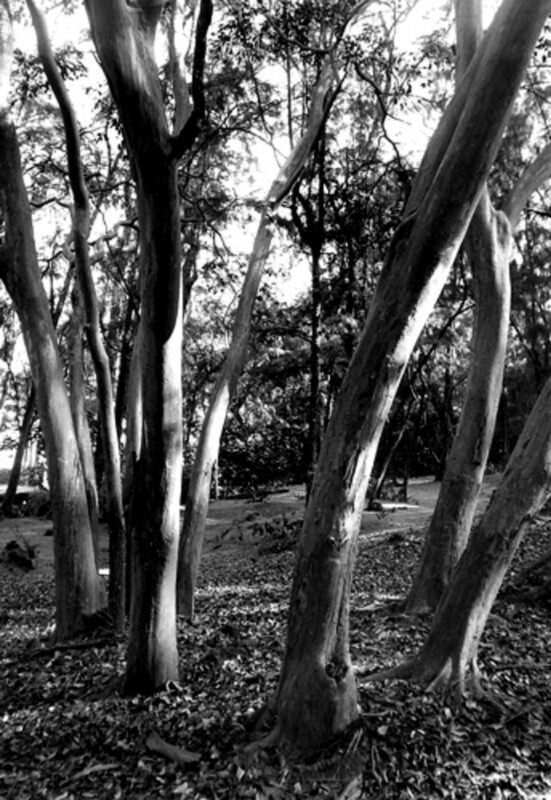 The author experienced a spooky incident at this park one late afternoon when he was walking around taking photos for this article: at one point he heard—faintly but distinctively—musical sounds (like from a guitar) right behind his back, but when he turned around, he saw nothing but the silent ironwood forest. All photos were taken with a Samsung Digimax 301 3.2MP Digital Camera. Daws, Gavan. Shoal of time: A history of the Hawaiian islands. Honolulu: University of Hawaii Press, 1974. We go there often. Someone told me they saw one guy jump off the cliff during a party, on acid. 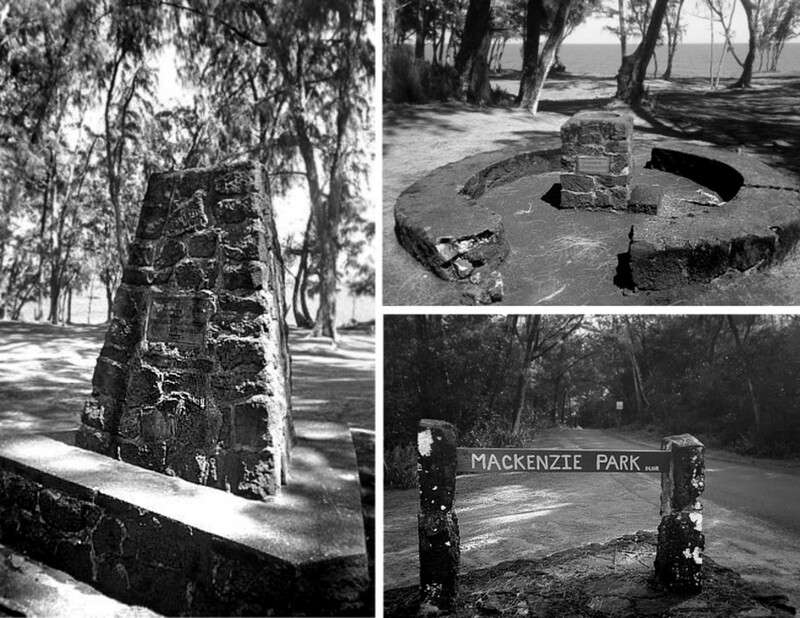 I stumbled upon McKenzie State Park in my first visit to the Big Island in 2001 right after 9/11 . At dusk an old car arrived at the shelter next to where I was camping , they looked Rastafarian she was dressed in beads and beautiful he had dreadlocks just to his shoulders matted brown red hair , he had a necklace that included these two horns , our conversation was very polite , they had been at a Native ceremony . Through this long evening and into early morning I met one of the great-grandsons of King Kalakaua . Many years ago, a friend and I camped at MacKenzie overnight. Aside from a long-time vagrant camper, we were the only ones there. As we drove and found our tent site, we got out of the car. Just steps away from the car door was a flat rock that had a set of car keys on top of it. I picked them up and dangled them to show my friend, "I'll bet this turned out to be a big problem." I said. I knew nothing about any hauntings in the park. We put up our tents, cooked dinner, and turned in (note: there are a lot of cockroaches that come out at night - not a great place to sit up and enjoy the evening). In the morning, we each got up at different times - I took a walk down by the cliff - my friend did likewise later. We then packed up to leave. My friend asked me for the car keys. I told her, I didn't have them - I didn't need them when I got up. She said I must have them, because she never used them that morning. I told her we always put the keys in your tent, and I didn't take them that morning. We looked all around the camp, all our pockets. Ultimately we unpacked our tents, and looked inside them. It's been 45 min. or so now - no car keys to be found. Repacked the tents. She got angry with me, accusing me of losing them; I didn't know what to do next - no clue - where could they be. About then, dejected and wondering what to do, I wandered toward the car, and there, on that same rock, were OUR car keys! How could we have missed finding them when we were looking, and how did they get there? We each knew we had not put them there. Same place as the other car keys. I told my friend it was the minehunes - she was not amused. I used to go to mackenzie almost every day. 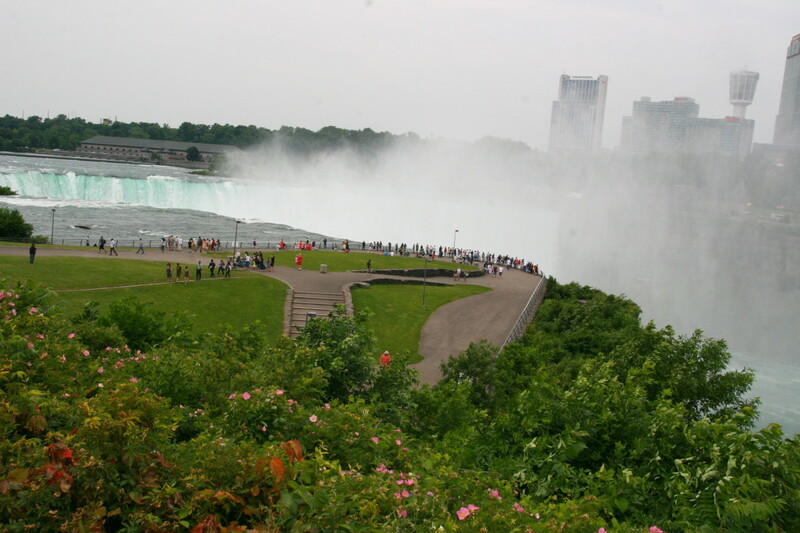 I love that place.....so beautiful and serene. Never experienced ghosts, but never went at nite. Loved hiking and meditating there. Most of the time I had the whole park to myself. The lava tubes are fascinating! Aloha Forbes! I always get interesting comments on this article, but yours is the most fascinating one! Thank you so much for sharing about your great grandfather and family history. I think Hawaii is a very spiritual place and not many people are sensitive to that “unseen” part of Hawaii. MacKenzie Park is one of those unique places that, beside the spectacular scenery, one may “feel” the past and mystery, which make it even more interesting to visit. Aloha Liz, thank you for your comment. Wow, it's so cool that your parents met here in Hawaii. I hope you have a chance to visit the Big Island soon and check out this beautiful park. Fascinating article! I'm most intrigued by the paranormal; in fact, we have a mischievous young girl spirit in our home. I've never been to Hawaii; but my parents met there during WWII, so it's on my bucket list as a spot to visit. I visited Mackenzie Park this Summer while staying a few miles away in Puna district on red road. I did not know the history, but was looking for things to do close by and maybe I could capture some good photos. As I entered the road leading to Mackenzie, I snapped a couple of photos of the amazing arched trees and such, which turned out to be very telling later. I entered the park, like others have said not many were there other than someone with a tent set up a little bit over to the left on top of a cliff. I felt an oppression as I took pics of the waves lapping the cliffs. I suddenly felt like I knew how someone died there and felt very emotional and cried. I never felt that kind of energy before. I started snapping pics all around like I needed to do this. The first was one I took directly behind me. The photo turned out to have a beautiful turquoise orb in it. You could see energy in the photo. Another I took in the woods behind had three orbs grouped together. I started walking to the trees on the right from where you pull in the entry and my battery drained on my camera, but not before I captured something odd behind a tree, like a hand. I left right before sunset. Less than a minute after pulling out something hard hit my windshield. It scared the crap out of me and surprised it didn't crack. I figured a coconut fell out of the tree. I didn't get out to look. Later, my photos taken going in show a ladder surrounded by mist being moved into the road by a hand in the tree. Two shots taken a couple of seconds apart show the tree changes shape. (Really!!) I can share these if you care to see I have several spirit photos taken around the big island. There is more... the next night I was driving back to cottage and GPS tried to take me back there. It never messed up before and when I got to the arched trees, I knew. 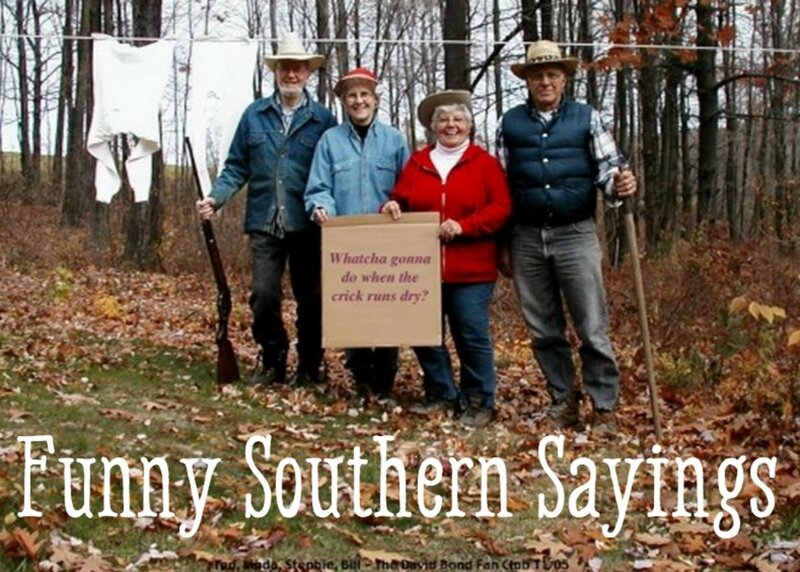 I said out loud, hell no! Funny how this article always seems to be republished almost every year at the end of October. Sure wish I could figure out why? Good story. I go there every week. Funny thing is that it ALWAYS seems to be empty. The whole area surrounding will be full of people, but not Mackenzie. this is a really scary place to visit even during the day! 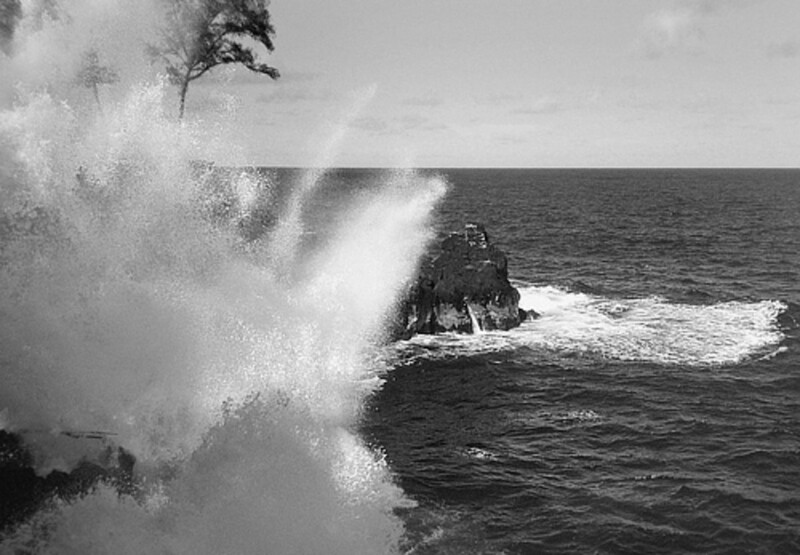 Although I don't believe in places being haunted, I'm still intrigued by their history and who wouldn't want to explore a piece of Hawaiian soil. Great hub and very interesting. Sounds like a beautiful beach so sad it is haunted. Sounds awesome and looks so beautiful! I'm not sure i'd be brave enough to spend the night. Though I probably would if it was necessary, but I would stay wide awake all night! This is such a well written and researched piece. You juxtaposed paradise with horror. Voted up aned interesting. yes I been to that park in the day time my father grew up in ophikau so I went to pretty much track his steps and learn more about the culture and his family.The park was empty my sister had to use the restroom,funny thing she went in and came out in a hurry and said that she could not use it and that we had to leave like now so we did. Having lived in Hawaii for more than three years as I went to school I have come to see many of the beauties that that the Hawaiian Islands have to offer. I stayed on the Island of Oahu while living there, but I do want to visit the Big Island one day. Pretty cool article, I love to hear about ghost stories in Hawai'i. However, another side to this story is that I've spent many many summers there camping and fishing and I have to say I've never felt creeped out by the place. Like everywhere you go you use common sense and respect the aina when i go there i take a plate of food as offering for visiting the park. Interesting! I've lived on the Big Island for 13 years, and have often heard of MacKenzie State park. I'm just now learning that it's haunted. I'll definitely have to pay it a visit! Thank you punacoast for this (and your other articles). I went to the forest today. I saw nothing supernatural but certainly felt it to be a sad place, probably knowing the history ahead of the visit contributed to this. A beautiful place, but I did not want to take any photos myself as I did not feel it to be the right thing (for me) to do. Did see some dogs - being walked by their owner. When two of the dogs saw me they charged over barking madly but once they made it to me they had wagging tales and let me pat them. Thank you again for doing this write up, otherwise I would never have know to go! very nice article, I really like it. There was also more murder's that actually happened in this park! Thank so much for your kind comments FlourishAnyway and Jeannieinabottle. It's really a beautiful place and the State just did a major renovation to the public restroom facility in the park so now it's clean and safe for everyone. Come visit soon! Aloha. What a fascinating hub. 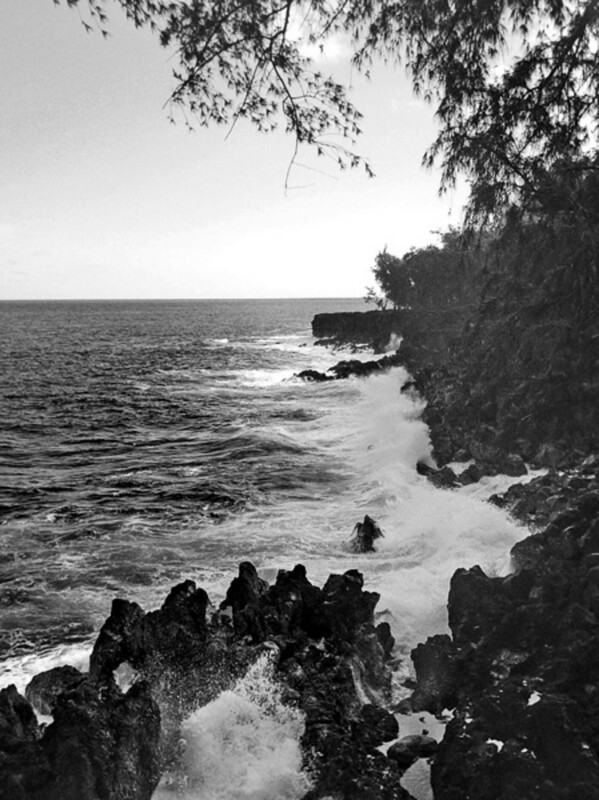 I love ghost stories, and I've always wanted to go to Hawaii, so this is great. 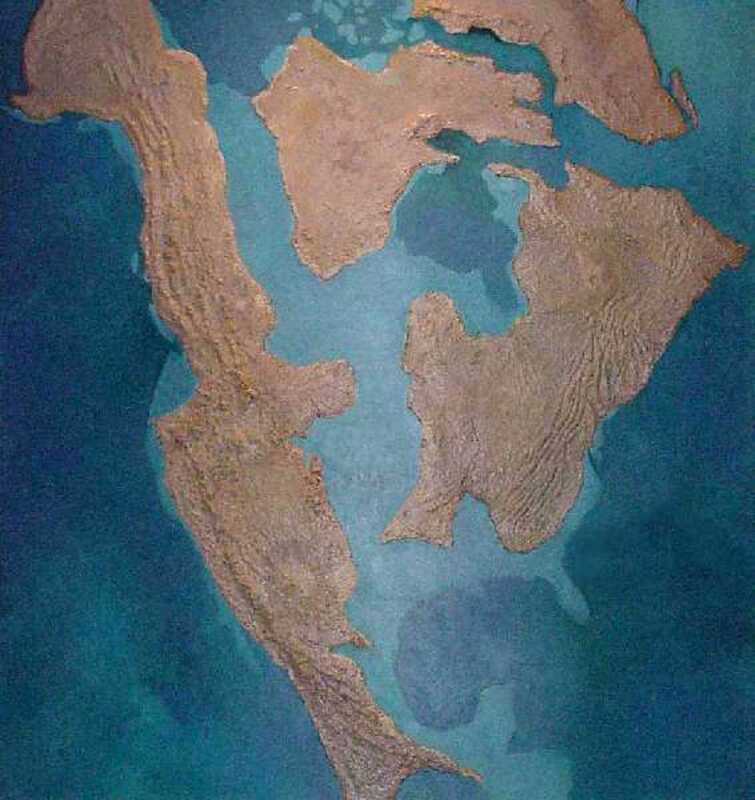 If I ever get to travel there, I definitely want to visit that park. Great hub and voted up! I enjoyed reading this, as it is both engaging and well written. I liked your addition of the personal account at the end. Voted up and more, sharing. I lived in Mackenzi Park for a year camping, never saw any supernatural events. Plenty of centipedes. I'm the buddy mentioned above who had the unfortunate task of directing my friends car through the gnarly tangle of trees and roots while this terrifying blood curdling scream appeared to track us. We had actually stopped at this beautiful park earlier in the day while other people were there and it seemed like it would be a great place to camp along the sea side. We even mentally picked out a place to camp along the cliff to the right of entrance. When we came back later that evening around 11pm I remember thinking wow there's absolutely noone here. We will have the whole place to ourselves. Normally I seek out solitude on my camping trips but I guess somewhere in the back of my mind I also couldn't understand why noone else would want to camp here but didn't give it too much thought. I remember thinking then that we would park in the parking lot and grab our gear and hike the 30-40 yards to our pre-picked out spot. But my friend was like "Why don't I just drive over there? There's no one here afterall!" So I agreed to get out of the vehicle and help guide him between the tightly packed trees and gnarly roots over to the west. I think it took us a good 10 minutes to navigate a few of the trees and only got maybe 2/3rds of the way to where we wanted to be when I heard the most god awful eerie scream I’ve ever heard. I was frozen stiff. I couldn't believe what I just heard and just as I started to convince myself I was hearing things I heard it again clearly but still somewhat off in the distance in the direction we were heading. I approached my friend on the drivers side of the vehicle and asked him to shut off the car and listen. I think I must have been as white as a ghost because he knew I wasn't kidding. When we both heard it it was definitely louder than the first two times I heard it and it sounded like it was coming towards us though still a bit off in the distance. I remember thinking that maybe the locals are messing with us or maybe the waves are hitting a blowhole or making some weird reverberation. I also recall it sounding like it was as if someone tied a piece of wood with a slit in it to the end of a rope and was spinning the rope slow and then fast and then slow again. But it sounded way scarier than that typical noise. We waited again for it and once we heard it again and the interval was much shorter I knew I wasn't staying the night. I told my friend we got to get out of here. I mean I was ready to ditch the car and just make a run for the exit of the park and take my chances running down the road. That's how scared I was. But instead I stayed outside the vehicle while helping my friend to reverse guide his vehicle back over the roots and through the trees. The whole time I was doing this I heard the screams repeatedly and they were much more frequent and they seemed to be following us. While it seemed to me to take my friend an eternity to back up his car he actually made it back to the parking lot in a 3rd of the time it took us to get to where we first started hearing the noise. I jumped in the vehicle shaking like a leaf and we peeled the hell out of there. needles from the iron wood trees make the rocks slippery on the edge of the cliffs. Easy for wind to blow you off. I know, this is not a place to visit for everyone, even some locals stay away from it! But I hope you will have a chance to see it for yourself someday because it's such a beautiful park. Adventure tour groups are now bringing many visitors to this park everyday as part of their sightseeing tour of this remote part of the island. Aloha! nice pictures! but the article really makes me nervous about wanting to go there! what with so may gruesome crimes and accidents taking place in there! i guess i'd rather spend time on the sunny side of Hawaii if i ever get lucky enough to go there! thanks for heads up! Thanks so much for the comments nenytrindiana. Indonesia is a beautiful country, I had a chance to live in Tanjung Pinang many years ago, such an enchanted island with old fishing villages and sugar cane plantations. Wonderful people and culture! And yes, plenty of ghosts too! Wow.. there are beautiful pictures! I loved them. I heard, in the ancient, some sugar mills in Indonesia also sacrifice some people in the manufacturing or production process.many sugar factories in my country, especially in the colonial era. Now some of the sugar mills are still haunted. Great job punacoast! Gorgeous pictures and I love the end about the musical sounds. Spooky! Great hub all around. Hi csjblogs! Thanks for your comment and I'm glad you enjoy the hub. 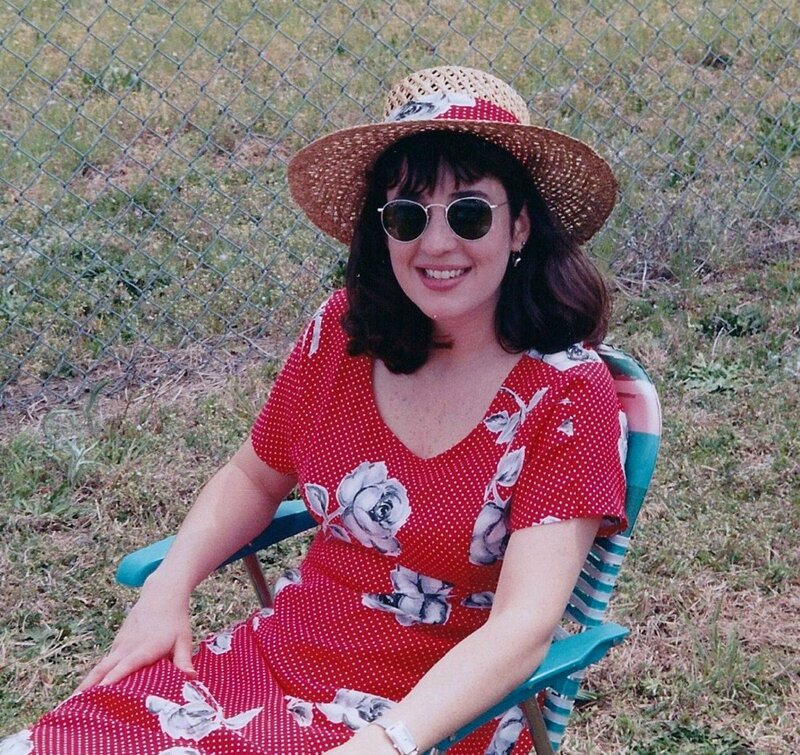 Aloha Elenin! Thank so much for your kind comments. I did have a lot of fun doing research on this park. It's such a wonderful place, only a few miles from our house and we enjoy going there for picnic and hike. great job on this. it was really insightful.